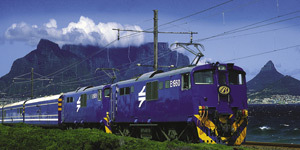 The Blue Train operates Cape Town to Pretoria or Pretoria to Cape Town, 3 days / 2 nights. Please inquire as to available departure dates. 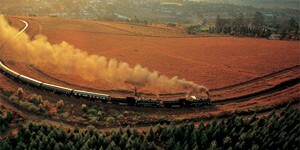 Rovos Rail departure dates and number of days vary by itinerary. Please click on the Rovos Rail Schedules and Rates link or inquire for specific departures and itineraries. Ask any inveterate traveler: an exotic sojourn by rail is one of the most memorable aspects of a journey. Whether it is a short over-nighter or a two week epic adventure, there is nothing quite so romantic and relaxing as a train ride! Both rail journeys offer a choice of routing, duration of journey and varying levels of cabin accommodation. The Blue Train, with modern muscle, moves faster and delivers travelers quicker to the end of the tracks. While Rovos Rail moves with demur and studied precision, in no particular hurry to reach the journeys end. Whichever style suits your mood and travel mode, set aside a little time for rail journeys of distinction through Southern Africa; you will be glad you did! The Blue Train has an aura of mystique about it. Kings and presidents have traveled on this magnificent moving five-star hotel. Sleek and speedy yet whisper-quiet, the Blue Train uses its magnificent muscle to deliver its passengers to their destination with elegance and speed. Travel to South Africa and take a trip on the most luxurious train in the world. Your romantic vacation through the heart of Southern Africa will begin or end at the headquarters of this private railway company, Capital Park Station and Locomotive Yard situated outside Pretoria.